Some investors are completely avoiding European stocks due to the current Irish debt crisis. However they be missing on some excellent investment opportunities. There are many EuropeanÂ multinationals with strong presence in foreign countries especially in the fast-growing emerging markets(EM). In fact, European multinationals derive more than 10% of their revenue from EM compared to just 7% for American multinationals. This is because many European multinationals have the “first-mover” advantage in capturing foreign markets due to their centuries-old presence there due to colonialism when great European powers ruled most the world. For example, long before Coco Cola(KO), Starbucks (SBUX) arrived in Asia, banking groups such as HSBC and Standard Chartered operated banking centers in many Asian countries. 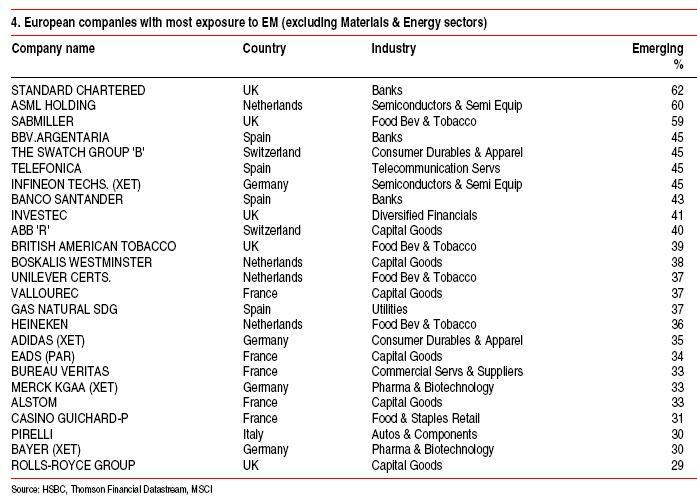 UK-based Standard Chartered Bank has the largest exposure to EM. It trades on the LSE with ticker STAN. Spanish banks Banco Santander(SAN) and Banco Bilbao Vizcaya Argentaria SA(BBVA) currently have dividend yields of over 7% and 4% respectively. 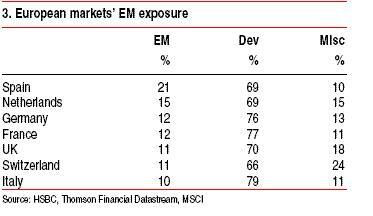 Investors who would like to add some EM exposure to their portfolio they are good picks at current or lower prices. Telecom services operator Telefonica (TEF) has a 8.04% yield. In addition to growing infrastructure spending, private consumption of goods and services is rising in EM markets as the new middle-class acquires consumer goods to raise their standard of living. Anglo-Dutch consumer goods giant Unilever (UN) mentioned in the list has a multitude of brands which enjoy a high popularity in developing countries. Switzerland-based ABB(ABB) is heavily involved in the infrastructure buildup in emerging markets such as India, Brazil, China, etc.